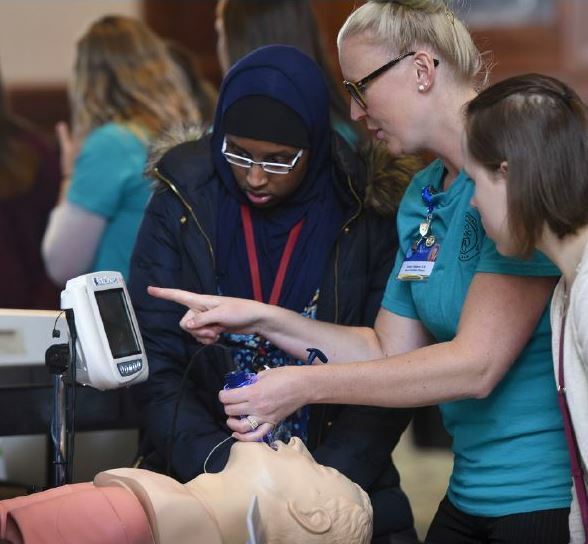 In the fall each year, Mayo Clinic School of Health Sciences hosts an open house for prospective students. Thursday, October 18, 2018, from 5:30 to 7:30 p.m.
Join us for refreshments and meet the deans of the school! Connect with current students in your programs of interest. Visit with the faculty and staff who can help answer questions and offer insight into the application and admission processes. Special tours from 6 to 7 p.m., take a "behind the scenes" tour of various clinical areas and see where instruction and learning take place throughout our programs. All public ramps are free for the first hour. Metered parking and ramps are free if you enter after 5 p.m. The Center Street Ramp, located on the northwest corner of Center Street and Broadway, is recommended for ramp parking. Please do not park in Mayo Clinic ramps, as these are reserved for patients. If you arrive by street level, the Siebens Building is located north of the Plummer Building and south of the Kahler Hotel. Enter through the west doors facing Annenberg Plaza and the Mayo Building. If you arrive by skyway level, pass through the Kahler Hotel skyway and follow signs to the Siebens Building elevators. See Academics for program details.